Originally hailing from the San Francisco Bay Area, saxophonist Peter Sparacino performs regularly in a diverse array of musical genres. After spending the early years playing clarinet in orchestras, the days of exclusively classical repetoire were cut short in high school after being exposed to the album “Blue Train” and the sonic opportunities of the saxophone. 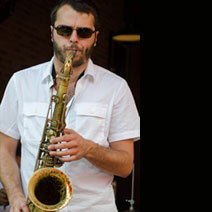 Peter switched to tenor saxophone soon after and attended the Jacobs School of Music at Indiana University, Bloomington where he was fortunate enough to study with acclaimed musicians and educators David Baker and Tom Walsh. After graduating, Peter returned to the San Francisco Bay Area and immersed himself in the vibrant music scene of the Bay, playing regularly with the top working big bands, salsa bands, and jazz groups in the premier venues in the city, including Pearl’s, Cafe Revolution, Amnesia and Club Cocomo. However in 2008, the call of New York and its legendary music scene proved to be irresistible and in the fall of that year Peter relocated to Brooklyn, NY where he currently resides. Since moving to New York he has played saxophone and woodwinds as a sideman and leader up and down the east coast and midwest, including renowned NYC venues Showman’s, Sullivan Hall, Barbes, B.B. Kings, the Knitting Factory, Brooklyn Bowl, Bowery Poetry Club, BAMcafe, Ella Lounge, the Tea Lounge, Arlene’s Grocery, Webster Hall, among many others; playing with such top rate musicians as James Zollar, the Javier Arau Big Band, Brother Joscephus, the Drumadics, the Saxophone Cartel, and his own groups to name a few. He maintains a busy schedule of performing, composing and teaching, in addition to arranging for various ensembles and transcription work. He is currently working on original music for a debut album, hopefully out by early 2012 (if the world doesn’t end). For more about Peter, visit www.petersparacino.com.